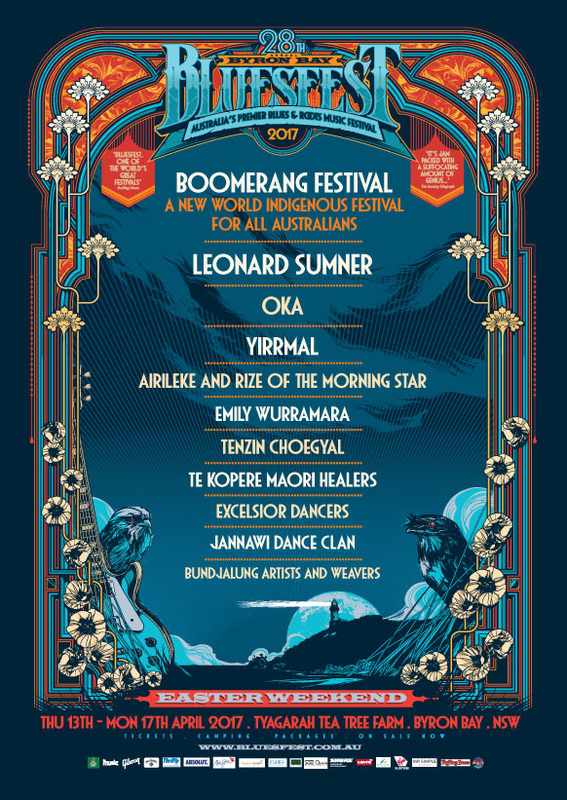 Bluesfest 2017 is shaping up to be a festival like no other, and here is yet another illustration why: Today we are so proud to be adding some serious flavour to the overall festival experience, welcoming back our much loved cultural & Indigenous event: The Boomerang Festival. Boomerang will host its own space creating an experience next to the Juke Joint. Peter Noble OAM and Rhoda Roberts AM and their team believe the time is right and Australia is ready to step out on the world stage and become known as the destination for authentic and quality Indigenous cultural exchanges. Managed and programmed from an Aboriginal perspective, Boomerang is a dedicated Indigenous performance and interactive event that showcases the excellence of first nations performance and culture. 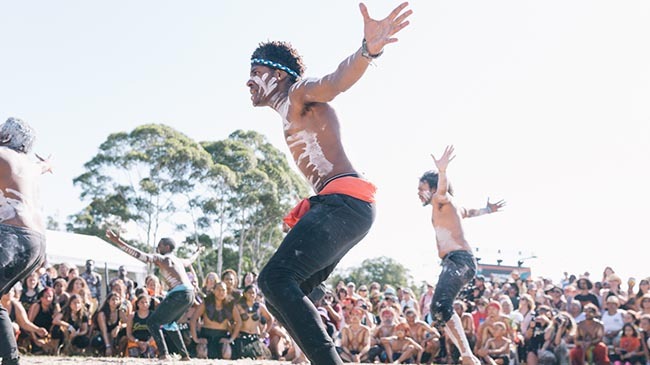 Bluesfest will come alive with a family-friendly precinct offering an inspiring, enlivening & diverse program of dance, language, Music , weaving, and traditional healing programs by some of Australia and the world’s foremost masters of their art. Boomerang, the festival is important please let me take a moment to tell you why I feel that way. I had an experience not that long ago, I was in London and went to the British Museum to see the exhibition called 'First Contact'. It's the story of when the British first discovered Australia, and of the interaction between them and the locals. Every 20 or so years the Brits dust off the Gweagal shield. It was on display at the exhibition, and I saw it for the first time. Upon inspection, it became a very emotional moment for me, as I could clearly see the holes in the shield from the musket bullets. My thoughts were that someone possibly died who was holding that shield. If they knew the power of the rifles facing them, I could not help but wonder, would they still stand their ground? For that day, when that shield was held to repel the invaders, was in 1770, and the place was Kurnell, in Botany Bay. It was the first interaction between indigenous Australia and the explorers in recorded history, one that would lead to the European colonisation of Australia, and it seems the Captain Cook's Soldiers came in to shore all guns blazing. A lot of water has gone under the bridge since that fateful day The outcomes from that first encounter still affect every Australian. Our original Australians have endured much at our hands, yet, despite so much, they have continued to be a pillar of what it is to be an Australian, as they are, and always will be our original culture. One that has continued beyond written history, and has so much to give us non indigenous people to enrich our lives. The Boomerang festival is a glimpse into this wonderful culture that exists all around us, and as Australians, within us, even if we consciously are not aware of that. Rhoda Roberts is its creative director, and I Am her proud logistical partner. Bluesfest is Boomerang’s current home, and one day it will be a standalone festival. In these days of zero support from our government Arts organisations, we have had to dig deep this year to cause the festival's continuance. However, just as our original Australians have survived, overcome adversity and flourish, so too will The Boomerang Festival. Not only is it a living example of our Indigenous culture, it's a lot of fun. Take some time to enjoy it, you won't be disappointed and, while I'm on my high horse: We need to bring the Gweagal Shield back to our shores for it to be on permanent exhibition for all Australians to see our REAL history. And perhaps have that moment in every one of us upon viewing that I had recently. After the shock of seeing the musket holes, I felt so many emotions. Anger, shame and yes, tears. But, more than ever, I felt a stronger determination to be a participant in true Reconciliation between me, and our original people. I ask you to join me in this quest. I am beyond convinced it is the most important thing each and every one of us can do to produce an even greater Australia. Bluesfest is proud to be one of the major contributors to the rich cultural fabric and artistic wealth across Northern NSW that entices thousands of people to the region every year. It now adds to that prosperity with the Boomerang Festival at Bluesfest 2017. 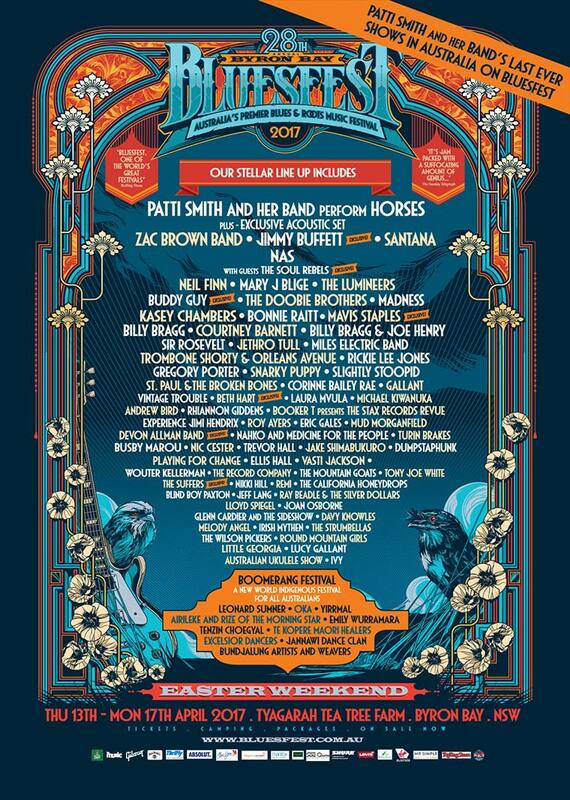 This is a true privilege for the Northern Rivers as well as Bluesfest and its audience to be part of, and is set to please a great many of festival goers. 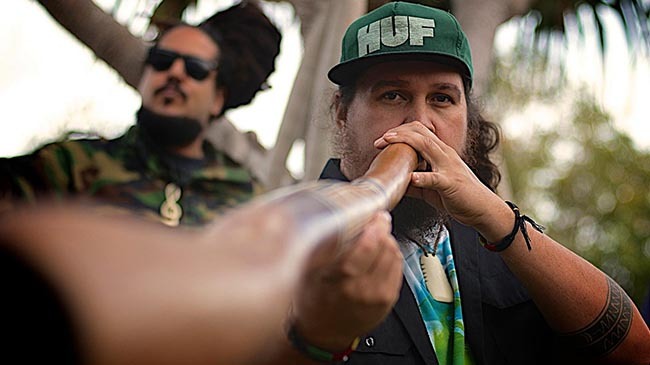 At the creative heart of the music is Stu Boga Fergie (aka DidgeriSTU) who connects you to earth with the deep subsonic pulse and resonance of his Yidaki (didgeridoo). 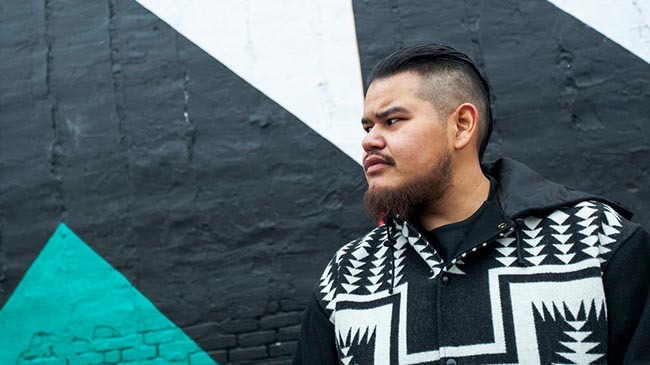 He is the big man behind the electronic beats, keys & vocals inspired by his First Nations heritage. Connecting a newfound sound and engaging the hearts of all who are lucky enough to hear him. 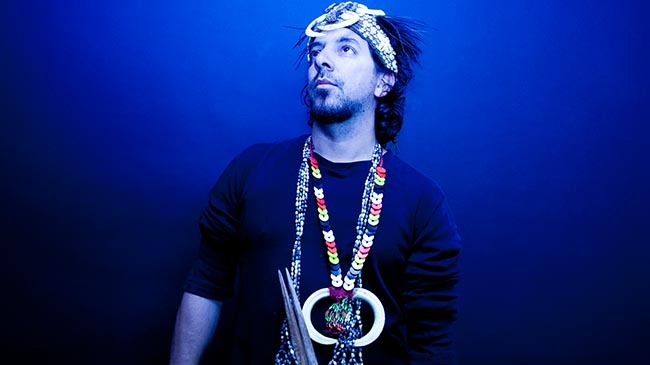 Papua New Guinean and Australian producer extraordinaire Airileke Ingram has created an incredibly eclectic and electrifying group that fuses traditional Melanesian sounds with an innovative selection of modern beats and adding the drumming of western Papua performers. 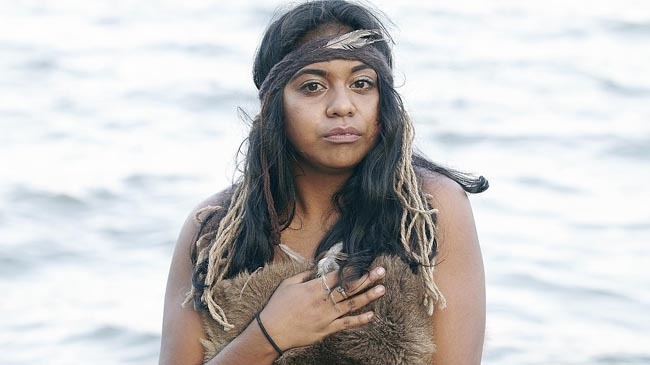 Emily Wurramara is driven by passion for culture heard through every beat and skip of her deeply engaging and personal songs sung in both English and Anindilyakwa, the traditional language of her home, Groote Eylandt in the Northern Territory. With national airplay on ABC local and Triple J, Emily has performed across the country and at festivals including Garma, Woodford Folk Festival, Island Vibes, Bellingen Turtle Fest, Clancestry and with a couple of Queensland Music Award nominations and Triple J Unearthed showcase at Big Sound she is someone to watch. In 1997, Tenzin Choegyal came to Australia with little more than a bag, his Dranyen and a voice full of passion for Tibet. 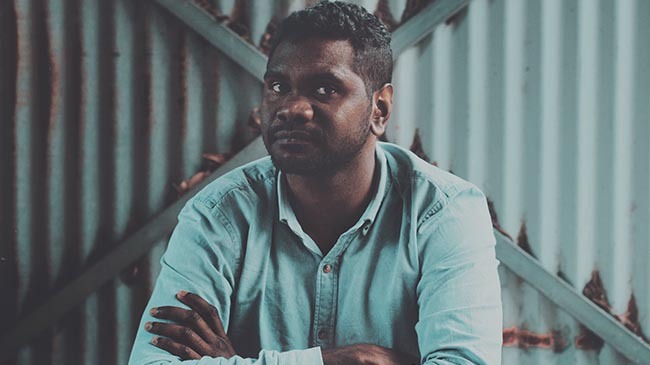 His raw talent soon caught the attention of the directors of that country’s largest folk festival, Woodford Folk Festival where he still plays to packed audiences each year. 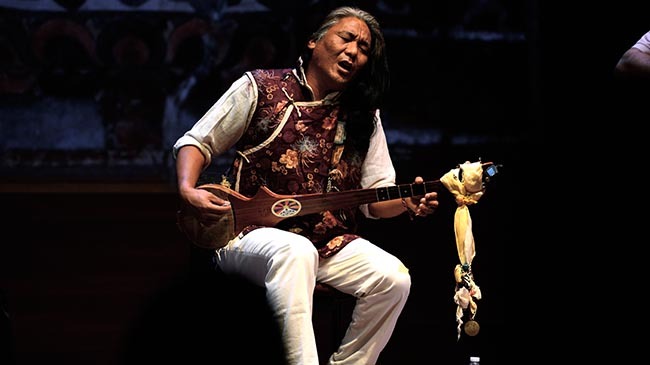 Over the years, Tenzin has created a successful international career as a musician, playing at such prestigious events as the WOMAD festivals as well as several Concerts for Tibet at Carnegie Hall, New York. 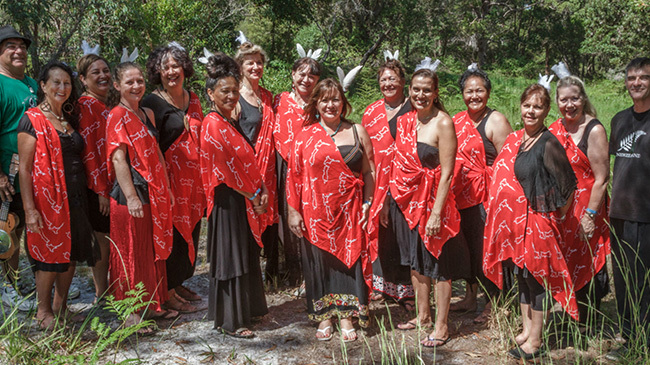 Under the guidance of healer Christine Bullock, New Zealand’s Rongoa Maori is the traditional healing system of Maori. It focuses on the oral transmission of knowledge, diversity of practice and the spiritual dimension of health. Rongoa Maori encompasses herbal remedies, physical therapies and spiritual healing. An exciting new dance company founded by a collective of aspiring performing artists and graduates from the Aboriginal Centre for the Performing Arts (ACPA), in pursuit of fusing modern art with the traditional art forms of first nations Australia. Excelsior made their debut in February 2014, at Queensland Performing Arts Centre’s ‘Clancestry’ and over the last few years they have performed across the country at various festival and events including the Sydney Opera House , Dreamworld, Woodford Folk festival and Boomerang Festivals. Jannawi artistic director is Peta Strachan, a Darug woman with a passion for Sydney’s language culture and stories. Peta is a multi-disciplinary dancer teacher, choreographer, set designer, and costume designer. Jannawi dancers and students are predominantly from the inner west suburbs and surrounding areas of Sydney. Jannawi recognises the enormous benefits gained through indigenous contemporary and traditional dance. Jannawi can go far in filling the void and providing a nexus for the strands of talent development, education and cultural identity engagement required in the young people of our community. 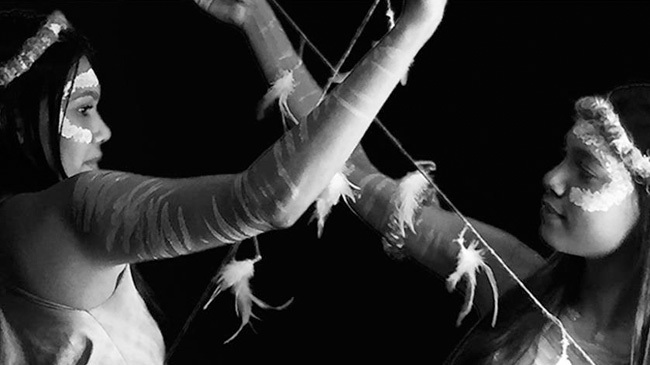 The company and its member collectively have performed across many festivals and events such as Woggan-ma-gule ceremony, Bangarra Dance Theatre, Woodford Folk Festival, Homeground, the Dreaming. Internationally they were one of the highlights at the opening of the Muse Du Quay Branly, Paris, The Sydney Olympics Opening and Closing ceremonies, Barangaroo opening events and more recently the Darwin Telstra Art Awards. When you weave you’re working with country…Objects from the past have the power to ignite the making of new things in the present. Bundjalung weavers have been inspired by baskets woven by Bundjalung women in the Richmond River district for more than 130 year. By studying these ancient baskets, the women have created new forms and designs. Featuring Local artist Aunty Gwen Hickling and Tania Marlowe there is the chance to make a basket , hear a story and learn some language. Open to all ages.